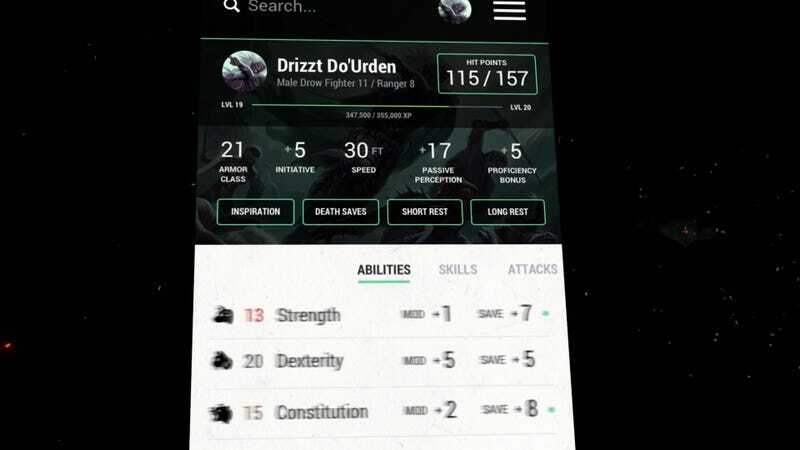 Can’t resist a Drizzt screen. Coming soon to PC, tablets and phones, D&D Beyond is the official digital companion to fifth edition D&D, giving players and dungeon masters instant access to rules, character builders and more. Does this mean we’ll stop using the unofficial support apps? No, but it’s nice. D&D Beyond is the latest stab at an official digital companion for classic tabletop role-playing game Dungeons & Dragons, aiming to deliver a wealth of information and utility to players and DMs alike. Want to roll a character? You can do that. Want to look up what a spell does? You can do that too. Want to calculate the THAC0 of a creature? Oh you poor, backwards fool. Wizards of the Coast is working with the Curse folks on the app. It looks really nice. Official Dungeons & Dragons applications and digital companion programs have been done before—I still have a boxed copy of Core Rules 2.0 around here somewhere. Players have been putting out their own digital stuff for even longer, multi-discipline geeks that we are. Still, it’s always nice to see the official stewards of the game giving the old digital age a go. D&D Beyond is launching later this year. You can sign up for the beta here.